A winding, 'edge-of-the-world' drive around the cliff-tops, packed full of lookouts, picnic areas and walking tracks, and right beside lots of galleries, cafes, gardens and accommodation. Echo Point and the Three Sisters, Sublime Point, Wentworth Falls Picnic Area and lookouts. Busy suburban streets with many intersections. The next stop is Katoomba Falls Picnic Area, a trackhead for the walking track network, then Echo Point with the visitor information centre and the famous view to the Three Sisters and Mount Solitary. Cliff Drive proceeds round the edge of the bush, past Silver Mist Park and Honeymoon Lookout to Leura Cascades Park - another walking trackhead. Cliff Drive ends soon after. Turn left into Leura Mall then right into Craigend Street and follow the signs down Sublime Point Road to Sublime Point. After a short walk to this majestic view, the trail follows the signs to Sydney, back out to the Great Western Highway. Turn left, go under the railway underpass and then immediately right. Follow the signs along Sinclair Crescent to Wentworth Falls Lake - a peaceful spot with picnic facilities, children's play equipment and canoeing opportunities. Continuing along Sinclair Crescent, turn right at the intersection with Blaxland Road, into the Wentworth Falls village centre. 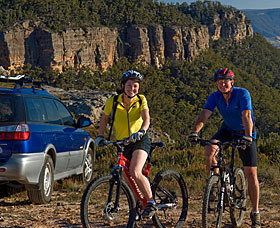 At the highway, turn right, then at the next traffic lights turn left into Falls Road and down to Wentworth Falls Picnic Area with its lookouts and walking tracks. The final stop is The Valley of the Waters Picnic Area and café, reached by driving a short way back along Falls Road and turning left into Fletcher Street. This discovery trail is a great day out with time to enjoy some key short walks, such as Katoomba Falls, Leura Cascades, Sublime Point and Princes Rock (at Wentworth Falls).